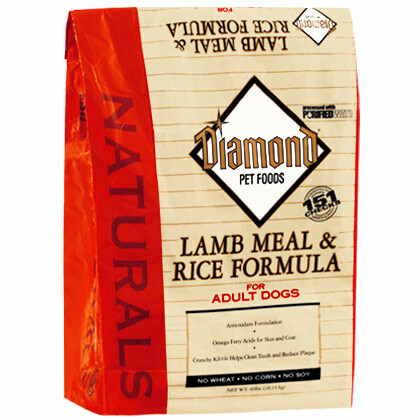 What is Diamond Naturals Lamb Meal and Rice Adult Dry Dog Food? Diamond Naturals Lamb Meal and Rice Adult Dry Dog Food is great for dogs who tend to like the taste of lamb or those that may be sensitive to chicken or corn. It contains vitamin E, selenium and omega fatty acids, which provides antioxidants to help keep the skin and coat healthy. The first ingredient is a named meat product in meal form and includes a multitude of grains. Diamonds Natural Lamb and Rice Adult Dry Dog Food does not contain any corn so it is suitable for pets that have corn allergies. It contains lamb meal, which is the sole meat product in the kibble. The main ingredients consist of low-allergenic, quality grains such as barley, rice and millet. When your dog bites down on the crunchy kibble it helps to keep his or her teeth clean and reduce plaque. Although this formula is mostly made from lamb meal, it does contain some chicken fat, which along with the flaxseed naturally makes up the omega-6 and omega-3 fatty acids that helps promote a healthy skin and coat. Feed to adult dogs that like the taste of lamb or may be sensitive to chicken or corn. Comes as a dry, crunchy kibble that helps clean teeth and reduce plaque. Ingredients: Lamb meal, ground rice, cracked pearled barley, millet, chicken fat (preserved with mixed tocopherols), egg product, rice bran, dried plain beet pulp, flaxseed, natural flavor, fish meal, potassium chloride, salt, choline chloride, vitamin E supplement, iron proteinate, zinc, proteinate, copper proteinate, ferrous sulfate, zinc sulfate, copper sulfate, potassium iodide, thiamine mononitrate, manganese proteinate, manganous oxide, ascorbic acid, vitamin A supplement, biotin, niacin, calcium pantothenate, manganese sulfate, sodium selenite, pyridoxine hydrochloride (vitamin B6), vitamin B12 supplement, riboflavin, vitamin D supplement, folic acid.